President Obama’s claim that he pays a lower tax rate than a teacher making $50,000 a year isn’t true. 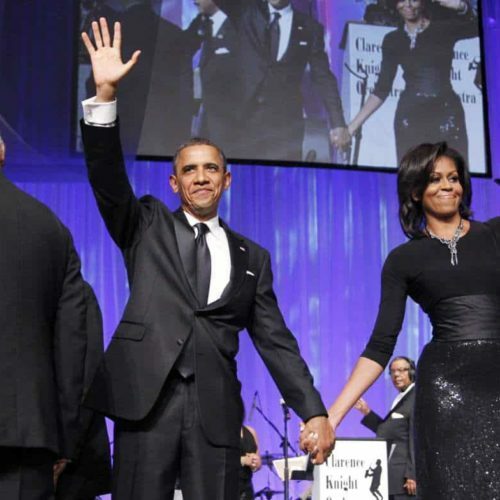 A single taxpayer with $50,000 of income would have paid 11.9 percent in federal income taxes for 2010, while the Obamas paid more than twice that rate — 25.3 percent (and higher rates than that in 2009 and 2008). And if the $50,000-a-year teacher were in Obama’s tax situation — supporting a spouse and two children — he or she would have paid no federal income taxes at all. The outcome is the same whether we count payroll taxes or not, and even if we look at what the $50,000 earner will pay on 2011 income. Whatever the assumption, the rates Obama paid were higher — and usually much higher. The president was on safer ground when he stuck to talking about billionaire investor Warren Buffett, who wrote in a much-quoted Aug. 14 New York Times opinion piece — headlined “Stop Coddling the Super-Rich” – that he paid a lower effective tax rate than any of the 20 other people who work in his office. That may well be true, though we have no access to Buffett’s tax returns or those of his employees. When we asked the White House about this, spokesman Matthew Vogel said: “The President was not offering a literal comparison of his personal tax rate. … He doesn’t say ‘I pay a lower tax rate than my secretary’ or anyone else.” We disagree. The president said: “Somebody who’s making $50,000 a year as a teacher shouldn’t be paying a higher effective tax rate than somebody like myself.” And in our judgment, that’s as “literal” as any comparison gets. Readers may interpret the president’s words as they please. The fact is, Obama pays higher rates than the $50,000-a-year teacher he mentioned. A family like the Obamas — with two children under age 17 — would actually have received a $37 tax refund in 2010 on income of $50,000, thanks largely to the $1,000 per child tax credit and Obama’s $800 “Making Work Pay” tax credit. Those are our calculations, which we confirmed with Nick Kasprak, an analyst at the Tax Foundation. A childless couple making $50,000 would have paid more — but still only a rate of 6.1 percent, assuming only the standard exemptions and deductions. And a single taxpayer would have paid 11.9 percent, still far short of the Obama’s effective federal income tax rate. It’s the same even if we include federal payroll taxes. We calculated that Obama’s overall rates — including payroll taxes — would be 31.8 percent in 2008, 32.2 percent in 2009 and 26.5 percent in 2010. For Obama’s $50,000-a-year teacher, the equivalent rate in 2010 would have been 25.3 percent if single and without children, 19.9 percent if married without children, and 14.1 percent if married with two children under age 17. Any way we figure it, the $50,000-a-year teacher (or firefighter, or construction worker) paid a lower rate than Obama last year. What’s more, the teacher will pay an even lower overall rate on thisyear’s income. The “Making Work Pay” credit has expired, which will push up the effective income tax rate a bit (though still nothing close to Obama’s). But that loss is more than offset by this year’s “payroll tax holiday,” which has cut the worker portion of Social Security taxes by 2 percentage points — which is worth $1,000 to workers (including teachers) making $50,000. We don’t deny that there’s some truth in the general point Obama and Buffett make about “millionaires and billionaires” sometimes paying lower tax rates than ordinary, middle-income workers. But stress the word “sometimes.” Very wealthy people often take some or all of their income in the form of dividends and profits on capital gains, which are taxed at lower rates than ordinary income. It’s also the case that Social Security taxes fall only on wage and salary income, and only up to a limit that is currently $106,800. So our $50,000 teacher pays Social Security taxes on every dollar of income, while those same payroll taxes fall only on a relatively small portion of the earnings of somebody making $1 million. Nevertheless, the president pursued his applause line well beyond the boundaries of truth when he started claiming (or if you prefer, insinuating) that he himself pays a lower rate than a middle-income teacher. He doesn’t. We calculated Obama’s federal income tax rate for each year by dividing the amount on line 60 of his form 1040 (“total tax”) by the amount on line 22 (“total income”). We calculated Obama’s Social Security taxes on the assumption that he and his employer (the U.S. government) each paid the required 6.2 percent on his Senate and White House pay up to the maximum for taxable wages, which was $102,000 in 2008 and $106,800 for 2009 and 2010. Since there is no limit on the amount of taxable wages for Medicare taxes, we assumed that both Obama and his employer each paid the 1.45 percent rate on every dollar he reported on line 7 of his Form 1040 (“Wages, salaries, tips” from Form W-2). For our hypothetical $50,000 earner, we calculated 2010 federal income tax liabilities using the 2010 “Tax Calculator” on the H&R Block website. Those calculations agree with the independent calculations of analyst Kasprak at the Tax Foundation. We used the Tax Foundation’s “2011 Marginal Rates Calculator” for 2011 figures.